Don’t get me wrong–I’m not trying to skip over any holidays here. I love November because it has Thanksgiving AND my birthday! But while browsing the Pottery Barn website the other day I came across this poinsettia pillow and knew I had to recreate it in my Christmas colors. This post was originally published a few years ago, but I have now added and SVG for cutting the felt petals with a Cricut Maker rotary blade! You will upload the SVG to Design Space, ungroup the image, and copy and paste a couple of times so that you cut out 5 petals of each size. Learn how to cut felt with the Cricut Maker here. Using the crochet thread, I stitched lines down the middle of each petal using a longer top stitch and shorter bottom stitch. To give each petal a bit of dimension I pulled on the thread a little before I knotted it so the felt scrunched up. Make the pillow. I had a pillow that I was just going to recover, so I measured it out and sewed a sleeve to fit around it. I used pillow cover instructions from Madigan Made. Sew the bells into the center of the flower. 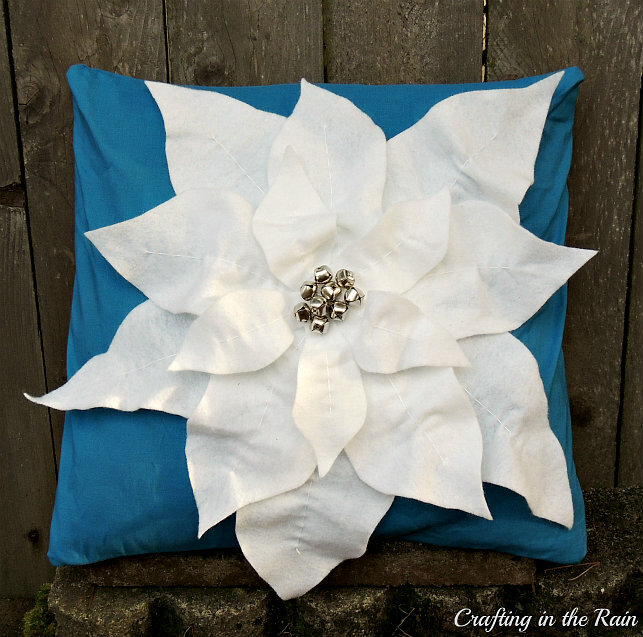 Attach flower to the pillow. Here you can do whatever you’re most comfortable with–stitching or gluing. I chose glue! Since it’s a decorative pillow, it won’t get much use, and the jingle bells will certainly discourage any napping on it. 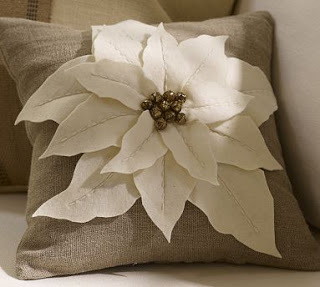 Now, go make your own poinsettia pillow to match your Christmas theme–and then I’d love to see it! Have fun!